The Spring 2018 issue of Advantage News – Advantage Newspaper Consultants works with newspapers to sell TV/entertainment magazine and digital advertising with a 5-10 day sales blitz that includes training and cash bonuses. 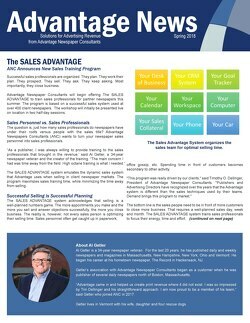 You do not want to miss the latest issue of the Advantage News! New program announcement and a call for Beta partners! The triumphant return of the TV magazine in Palmdale, CA. An introduction to Media Analyst, Tammy Abbott. Reminder: Check the cover of your TV magazine to see if THIS is missing!